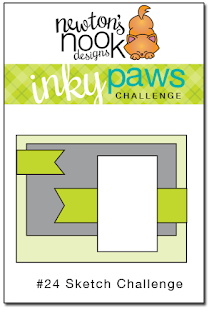 Inky Paws Challenge #24 Winners! We loved seeing all the ways everyone used the sketch for this challenge! THANK YOU to everyone who entered! All the beautiful entries always make it SO HARD to choose the winners! 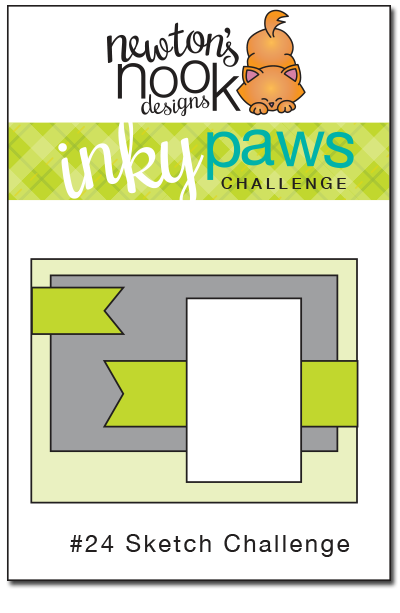 Our first winner is this fun card by Naki! We loved how she used a fun chevron cut out shape for one "flag" on the sketch and the reverse of the cut out for the other - such a fun idea! It looks like those arrows are helping guide the snail from our In Slow Motion! Our second winner is this fun card by Magda! Can you believe she just started card making and this was her first card post? 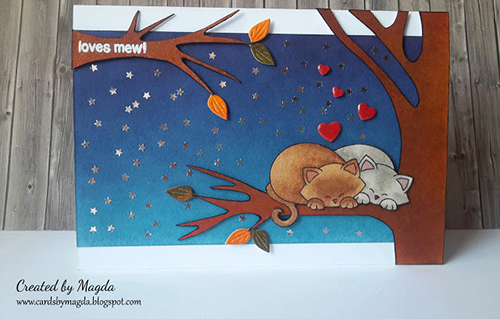 We love how she hand-cut trees to make the sketch and used the snuggling kitties from our Newton's Antics stamp set nestled in the branch! Adorable! Congrats to Naki and Magda! Don't forget to send us an e-mail at info@newtonsnookdesigns.com to claim your $10 store credit and get your winner badge for your blog! 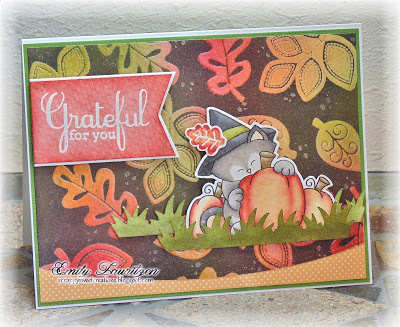 We love this beautiful Fall card by Emily! She used our fun bold leaf set, Falling into Autumn to create that fun gorgeous background. Then she added the fun kitty from our Newton's Perfect Pumpkin stamp set - I love the way she interpreted the sketch too - so creative! This card by Deb tickled our funny bone! 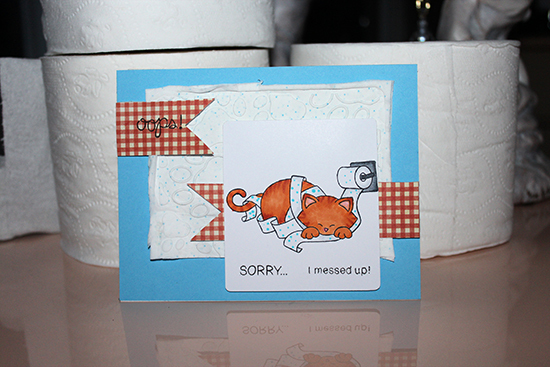 I love how she used the image of the kitty with the toilet paper from the Naughty Newton stamp set and used ACTUAL toilet paper to create a background! So fun! 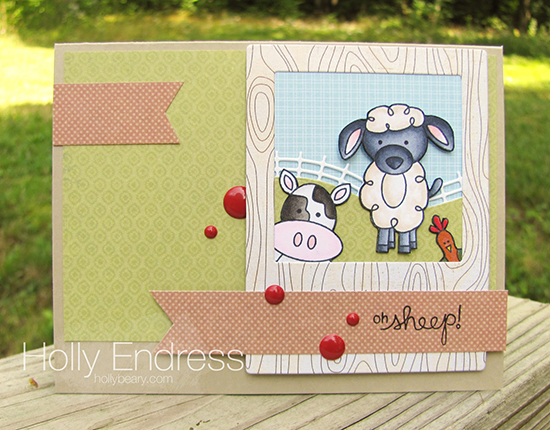 Our third favorite is this fun farm card by Holly! 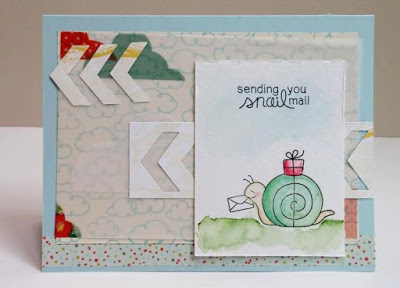 We love the fun way she created a little window scene using the animals from the Farmyard Friends stamp set! This card made us smile! Thanks again to everyone who entered - It's really so much fun to look through all the entries and see everyones ideas! If you didn't win this time we hope you'll play along again next time! Save the date: the next challenge will begin on September 18th.